This large, 3.500 sq ft. oceanfront estate home sits on 2/3rds of an acre and has 5 bedrooms and 5 baths (sleeps 12). In addition, It also features an expansive (1,100 sq. ft.) covered ocean view terrace with a large seating and dining area, including a Weber gas barbeque. VRBO is not able to price out options so the price you see on this website is for the house only which sleeps 12. If you have a larger group you may also add our optional (1,000 sq ft) apartment (an extra charge of $195 per night) on the estate which adds another bedroom and bath, sleeping up to 5 more, and brings the total accommodations to 17 for both home and apartment. This apartment offers you a great deal of flexibility as it is optional, and may be added later if your group becomes larger than originally planned. If you don't use it the apartment will go empty to maintain your privacy. You will always have exclusive use of the property. If your group gets even larger we also have a beautiful 1,080 sq ft two bedroom two bath beachfront condo available just down the beach from our house which can accommodate up to 6 guests. It is apartment G-10 at the Maalaea Surf Resort and photos of our condo are included on their website. Contact me for reservations. IMPORTANT NOTE: This home is a legal vacation rental property, and has been officially approved and licensed by the County of Maui. A significant number of Maui vacation rentals are not licensed and operate illegally to avoid paying the 14.42% tax due on rental income . The County of Maui Enforcement Division is aggressive in shutting down illegal vacation rentals. Our home is located on the south-west coast of the beautiful tropical island paradise of Maui. The house was originally built as a beach getaway for a wealthy Maui family living on the slopes of the nearby Haleakala volcano. Built on 2/3 of an acre, and fronting the beach and ocean, the house has the feel of old Hawaiiana with its lava rock walls and fireplace, high beamed ceiling, large covered lanai, expansive lawn, private pool, and beautiful tropical landscaping, which includes a wonderful old Banyan tree, large Monkeypod tree, tropical fruit trees, and 10 palm trees. With its expansive grounds and sleeping capacity, it is perfect for extended family groups, reunions, anniversaries, and other celebrations. Weddings or receptions are not authorized, but low key family celebrations such as birthdays or anniversaries are welcome but attendees are restricted to guests listed on the Rental Agreement. The moment you walk through the double door entry you will be treated to an expansive, 180 degree ocean view with the white sand beach just 50 feet from the front of the property. We face West and you will enjoy amazing sunsets and during the whale season lots of whale sightings from you lanai. Our home offers everything you could want in a large, luxury beachfront vacation rental. With its lava rock wall, and electronic entrance gate, you'll enjoy complete privacy and security. There is secure off-street parking for up to 6 vehicles. The home is perfect for extended families, and a great place to host celebrations and other events, however we want to stress that this is not a party house, and we do ask that, in respect to our neighbors, noise levels be kept moderate at all times, and that quiet hours are maintained from 11 pm to 7 am. All events and special celebrations must be approved in advance by the owner, and in some cases there may be a special event fee included. In the main home the large master bedroom has a king bed and a queen sleeper sofa. A second, slightly smaller ocean front master bedroom also has a king bed and ensuite bath. There are also two bedrooms that have queen beds sleeping 2 each, and one bedroom that has twin beds sleeping 2. The (optional) apartment on the estate is large (1,000 sq ft) and includes a living area, dining area and kitchen. The bedroom has an en-suite bath and a queen bed. A queen sized sleeper sofa and a one-person sleeper sofa are in the living room of the apartment bringing the apartments sleeping capacity to 5. Our house is really one of a kind... you will be hard pressed to find another oceanfront luxury vacation rental that sleeps this many people comfortably at this price level. As you can see from our busy reservations calendar, others agree as well! You may view all of our available dates by clicking on the availability calendar on the top of this webpage. PLEASE NOTE... We do not list our home on Craig's List. If you see our house listed there it is fraudulent. We also do not request payments via wire transfer. Any requests for payments via wire transfer for our home is an indication of fraud. Our Estate Home has a full laundry room and two refrigerators to handle the crowd. A third refrigerator is in the apartment. There is a huge entertainment size living area (31' x 23') and three large dining tables.... one inside and two on the covered ocean front terrace. This shaded terrace is 23' x 47' adding an additional 1,100 sq ft of outside living space and also has a comfortable outdoor seating area. The inviting private pool is solar heated. We've added many upgrades in the last few years including a 55 inch HDTV, all new major appliances in the kitchen, new outdoor dining tables with 12 chairs, an outdoor lounge seating area, six pool lounges, and new bedspreads and drapes in the bedrooms. Three bathrooms have been completely remodeled in 2018. In 2019 all 5 bedrooms had new floors and base boards installed. Outside the landscaping has been upgraded as well. The white sand beach in front of the house is one of the best swimming beaches on the island, with gentle waves, and is very child friendly with no undertows or currents. And if you like to walk the beach, there's over four miles of uninterrupted sand, all the way to Maalaea Harbor! Our service staff will be on the property from time to time during your stay, but will be as unobtrusive as possible. Our caretaker will drop by to remove the trash on Sunday and Wednesday night, and our landscaping service and pool service is scheduled for every Friday morning. Our cleaner uses the laundry room in the garage weekly to wash and dry towels and bedding, and occasionally other service people will arrive to make repairs, etc. 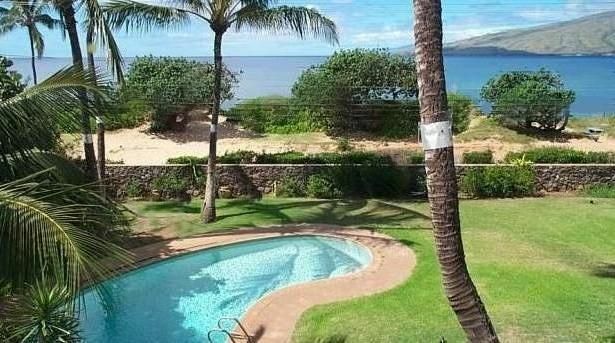 Keywords: Beautiful, spacious, luxurious vacation rental home, tropical holiday villa, beachfront, ocean front house, waterfront, kihei maui, hawaii. sandy beach, private pool, swimming, snorkeling, windsurfing, whales, wireless internet, washer, dryer, gated retreat. I've been vacationing on Maui most of my life and while I've traveled extensively, I have always found Maui to have the best of what I'm looking for.... great weather, a relaxed atmosphere, friendly people, and the tropical beauty and diversity of the islands. It's easy to understand how Maui has been voted time and time again as the top island destination in the world! This house was originally built as a beach getaway for a wealthy Maui family living on the slopes of the nearby Haleakala volcano. Built on 2/3 of an acre, fronting the beach and ocean beyond, the house has the feel of old Hawaiiana with its lava rock walls and fireplace, high beamed ceiling, large covered terrace, expansive lawn, private pool, and beautiful tropical landscaping, which includes a wonderful old Banyan tree, large Monkeypod tree, fruit trees, flowering plumeria trees, and lots of coconut palms. With its expansive grounds and sleeping capacity, it is perfect for extended family groups, multiple families, reunions, anniversaries, and other celebrations. Our guests include many extended family groups and the large (optional) apartment on the property provides guests lots of flexibility as they may add the apartment to the rental at any time if the size of their group grows. Four bathrooms were completely remodeled in 2018. There is also an outdoor shower next to one of our lanais that may be used to shower off the sand and salt water after returning from the beach. .
Our front yard is located only 50 ft away from a beautiful white sand beach located directly in front of our home. We enjoy a western exposure with beautiful sunsets nightly. Whale season is November thru April and in-season, we usually can spot whales daily from our front lanai. We have a view of the summit of Haleakala Volcano from our home. We enjoy a 180 degree front row ocean view. We have a wonderful expansive west facing view of the ocean. There is a beautiful white sand beach directly in front of our home... just 50 ft. away. Our wide angle ocean view is unobstructed. We have a beautiful white sand beach right in front of our home that is a great for swimming and water sports..
a high capacity dryer purchased in 2012 is available free for your use. Secured parking available for up to 6 cars within the walls of the estate. Wireless internet is available throughout the house... and has been upgraded to the highest level available to handle a crowd. even out on the terrace. Bring your laptop and use it throughout the property. We have installed a fast router with great range, that can support a number of users simultaneously. (2) There are two refrigerators to handle a crowd. The primary one is stainless steel purchased in 2019. The second was purchased in 2014. There is a third refrigerator in the apartment. A new cooktop was purchased in 2014. The kitchen has been remodeled with granite counter tops, double ovens, two refrigerators, and a breakfast bar. An inside dining room seats 10 and two outside dining tables seat 12 more for a total of 22. There is a 55 inch HDTV in the living room. We have HD cable with a 55 inch flat screen HDTV, complete with blueray player. You will find pool and beach toys for the kids, lawn games for the family as well as two sets of golf clubs, boogie boards, and snorkel gear, all at no charge. Our lawn and garden are expansive providing the kids lots of room to roam, all within the privacy and safety of our lava rock wall. Lots of separate seating areas for the adults as well. Your large living room leads to a large covered oceanfront veranda , which serves as an outdoor living room. This leads to a level lawn leading to the private pool. In 2014, we added a large 1,000 sq ft ocean front covered lanai complete with an outside living room, dining room and weber grill. The home is on one level, however some of the door openings are not wide enough to accommodate a wheel chair. The kidney shaped pool is heated via a solar hot water system installed on the roof. It was completely rebuilt in 2013. This tropical Hawaiian Estate home sleeps up to 12. If you need more room, you may add our a large (1,000 sq ft) one bedroom, one bath apartment on the property for $195 per night that will sleep 5, bringing the sleeping capacity to 17. The apartment's kitchen has a refrigerator and cooktop but no dishwasher and is designed to be used as additional space, rather than a stand alone apartment While this large home is perfect for family groups, reunions, retreats, or small company meetings, I need to emphasize that it is not a party house. There are ceiling fans in all bedrooms and public rooms. The estate is completely private, surrounded by lava rock walls with an electronic entry gate. It enjoys a wonderful western facing ocean view of the whales and amazing sunsets. Our beach also offers some of the best windsurfing and kite surfing conditions on this side of the island and on a windy day the colorful sails and kites are quite a sight! The house was perfect for 2 families of 4 and 2 couples. The living room both in and outside was the perfect gathering area. The house was very clean and offered plenty of extra toys and games to keep all ages entertained. We loved every minute of our stay. My family and I love this place. It was worth every dollar for the memories we created. It has everything you could ever need while on vacation in maui; pool, laundry, full kitchen, beach toys like beach chairs and umbrella. Would return, loved sitting on the patio watching the whales while the kids played in the pool. Plenty of space for family of 10. Great location to see the island. Owner and caretaker were very responsive to questions. Only minor downside is traffic noise but being close to beach/view is worth it. Well maintained property with beautiful palms, plumeria and other native plants. Not having air conditioning is not an issue the breeze naturally cools the home very comfortable. Our family (15 people) joined in Maui to celebrate my wife's birthday.Between the beautiful beach across the street, swimming with turtles, a entertaining Luau, trips to beautiful upcountry, and dining at Mama's fish house, we feel we couldn't have chosen a better location. The house wqs in perfect condition, and with a friendly caretaker who was aviabile on cell, our stay was unforgettable. I had done a lot of research looking for a beach front house, with room for our family of 14 and this house was everything I had hoped for and more!! My husband and I planned this dream vacation for our 3 married daughters and their families. We ranged in ages 58 years to 7 months. We all enjoyed our own bedrooms and bathrooms, plus the living spaces are large and open. We felt at home, and relaxed on the lanai and by the pool. The kids LOVED the pool and all the pool toys that were available. We appreciated the security of the yard, and never worried about the little children. They could run and play in the large well maintained yard to their hearts content. We spent several days at the beach, which was very private and within a short walk. It was so nice to have the use of beach towels, umbrellas, ice chests and sand toys. There was even a "Baby Nook" beach tent for our littlest grandson, who could play inside, out of the sun and sand. We even booked a professional photographer to take family photos down on the beach. This was a dream vacation and everything I had hoped for. This house was awesome and we would love to come again! The house was clean and very well equipped. We had many children with us and the place was perfect for them. Would love to stay at Robert's house again! We are located in quiet residential neighborhood, directly across the street from a beautiful white sand beach. It offers great swimming, fishing, boating, snorkeling, and beach walking. Our home is in N. Kihei, extremely convenient to beaches, shopping, restaurants and activities. 30 minutes to Lahaina, 20 minutes to the airport, and 15 minutes to Wailea.